Armed with a net gun and a fishing rod fashioned into a kea-catching device, I headed into the hills around lake Rotoiti earlier this year to count & band kea as part of a 3 year population survey. Here’s the second installment of my diary …..
After sitting on the rock for an hour or so the drizzle started to turn into rain, so I gathered my things and headed for my tent. Time passes slowly when you are sitting in a tent with three bland walls to stare at, waiting for the weather to improve. Eventually it did though and I repositioned myself back on top of the rock. There wasn’t much kea activity but there were plenty of other things to watch that provided amusement. One was a fellow member of the survey team who had positioned themselves on a point below where I was; it was interesting to see them going through their processes of setting up their own vantage point. Maybe it seemed more interesting than it really was because of the lack of human interaction I had had during the day. Something else that caught my eye was a family of goats that were feeding on the bush edge; there was a nanny, a billy and a kid. At this point I was wishing I had packed my rifle in with the rest of my gear, but that would have made my pack much too heavy. This family of goats were in view for about an hour and a half, it was interesting to watch them with such focus. They made their way up the mountain coming within 30m of my rock, eventually reaching the summit and descending over the other side of the ridge. The evening survey ended with no Kea observations and the morning was much of the same. So once again I made my way down the mountain. The incline was steep, the footing wasn’t the best and as you guessed, this resulted in quite a tumble. My foot slipped on some loose rocks, I stumbled and lost my footing, after gaining some quite considerable momentum my leg then got caught around a single Kanuka trunk and I completely changed the direction I was facing. Instead of sliding feet first I was now sliding down the hill with my head in the downward position, like a backwards luge. I thought I might be slowing down when I suddenly felt the feeling of being unsupported by terra firma, I was indeed flying, ever so briefly, through the air. Surprisingly I had quite a gentle landing, I think it was all that stuff in my pack that broke my fall. I came out of it a bit shaken and with an unimpressive graze on my leg. I managed to get to the bottom of the valley without anymore mishaps when I thought it would be a good idea to take a short cut to the river crossing. The map on the GPS showed that this would be fine, but what I didn’t know was that GPS maps don’t show bogs as part of their detail. I was committed to the trudge and made it back to the meeting point safe and sound. The journey to my next survey points were much the same as before, I was alone, it was steep and it was a beautiful place to be. 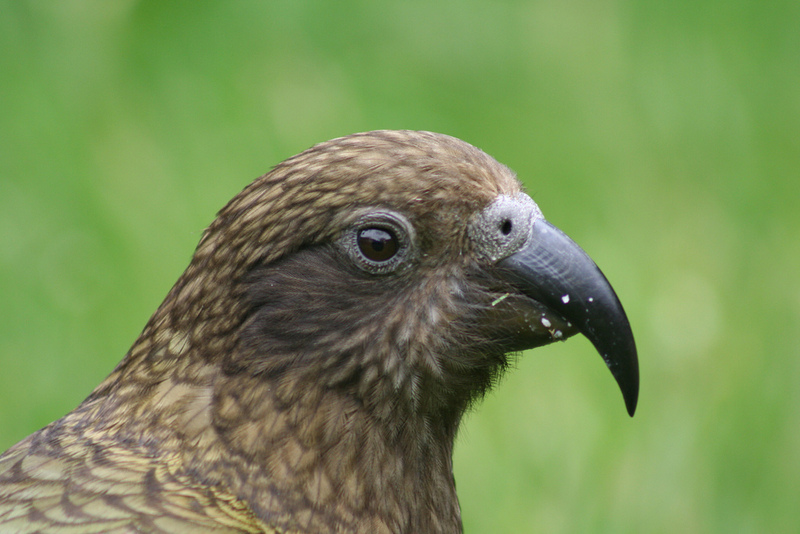 The only difference about this particular site was that there was Kea! After yet another rehydrated dehydrated dinner mixed with noodles I prepared for the survey period. Not long after that I heard one pretty close and soon had an encounter with it. This particular bird definitely wasn’t shy; he immediately investigated all my belongings. He jumped in my cooking pot, rearranged my washing that was strategically placed on the rocks to dry and he hung around for at least an hour. I managed to identify this particular bird by taking photos of an old leg band and zooming in on my camera’s LCD screen. It was good to find out that he has been in the area for a while and still going strong. Because I was by myself it wasn’t really practical to catch him: putting transmitters on kea is a two person job – the first to make sure the other doesn’t become a chew toy and the second to fit the transmitter. This bird came and went a few times during the survey period and even came to visit me in my bivy bag. It was quite eerie having a kea sitting above me in the dark with the moonlight behind him and him calling in a way I had never heard before. I think he got bored of me once I started snoring because he was gone when I woke up. After this survey it was time for a break back at the lodge. I got all the washing done, brought some food to supplement my dehydrated food packs and we all talked about the surveys that we had under our belt. We even had time for a relaxing swim in the lake. The water was beautiful but the area around the wharf was quickly vacated when it was discovered that huge eels were occupying the same area. A shower was the best luxury of all and was savoured because I did not know when the next one could be! We all rested up back in civilization and prepared for the adventures to come in the next few days.